Click on the photo at right. I make my living as both a shakuhachi performer and maker. My schedule is very fluid. Performing takes precedence, and I fit instrument making between performances. When I was apprenticed to Chikusen Tamai, who taught me to make shakuhachi, he used to say that being a performer and a maker at the same time was like trying to wear two shoes on one foot. In a way I think he was right. It probably is a good idea to specialize in one thing that you do very well. But I love to perform and I love to make shakuhachi, and I probably couldn't make a living just doing one. So here I am with two shoes on one foot. Especially in the case of shakuhachi, I have found that playing has made me a better maker, and making has made me a better player, and that it is possible to do both at once. 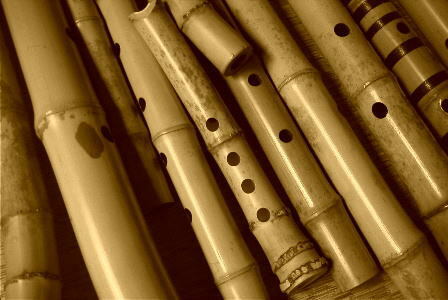 However,(there had to be a catch) I can only make a few shakuhachi at a time, perhaps at a pace of one instrument per month, but even that varies. Ideally, I would have a huge stock of instruments already made so that I could respond to orders right away. and it may have something to do with my personality that I have nothing in stock. I always think, "I'm going to make lots of shakuhachi so I can have some in stock". Today I am still thinking it. I may not be such a great businessman, so I am deeply indebted to the people who like my instruments enough to want to play them. Thankyou, thankyou, thankyou. My shakuhachi are all essentially made-to-order. It usually takes from about six months to a year to finish an instrument after receiving the order. Standard shakuhachi (made with ji and a nakatsugi joint) are tuned to equalized tuning, A=442 (though this may vary with the player). The utaguchi (mouthpiece) insert can be in Kinko, Tozan, or Kinya-style. Yes, I do repair work, too. Feel free to Email me with your questions.